The 5-HT7 receptor class is one of seven major subtypes of 5-HT receptor (5-HT1–7) exhibiting a distinct profile in terms of structural properties, functional coupling and pharmacology. The receptor is widely localized in the brain and is expressed neuronally, in both terminal and cell body regions, in a number of brain areas relevant to sleep including, pyramidal neurons of the hippocampus, the suprachiasmatic nucleus (SCN) of the hypothalamus and the dorsal raphe nucleus (DRN). 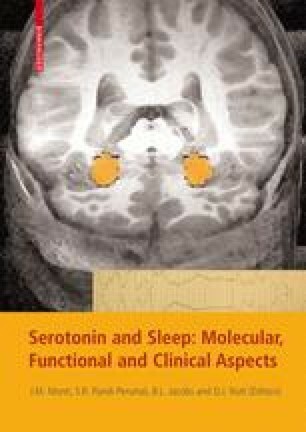 Brain functional studies utilizing 5-HT7 receptor-selective antagonists suggest the 5-HT7 receptor plays a role in modulating 5-HT neuronal activity in the DRN, a brain area implicated in the control of sleep. Thus, alteration in 5-HT7 receptor function might indirectly modulate sleep architecture. Consistent with this possibility, systemic administration to rats of selective 5-HT7 receptor antagonists such as SB-269970, increases the latency to onset of REM sleep and reduces the density of REM sleep, without significant effects on other sleep parameters. A qualitatively similar profile has been reported in 5-HT7-/- knockout mice, which spend less time in REM sleep without alteration in wakefulness or slow-wave sleep. Microinjection of SB-269970 into the DRN in rats produces effects on REM sleep consistent with those observed following systemic administration. These findings support a role for 5-HT7 receptors in the DRN in the mechanisms underlying REM sleep formation. To date, no clinical studies have been carried out that investigate the therapeutic potential of selective 5-HT7 receptor ligands. However, based on the pre-clinical findings, it is tempting to speculate that such ligands might exhibit utility in disorders where disrupted REM sleep is a feature.